A helpful sign points to a way around the work site Wednesday afternoon. 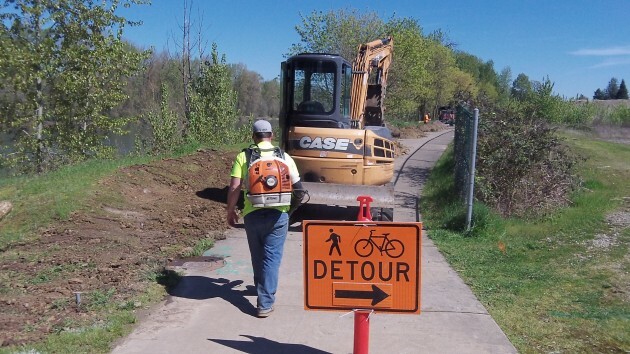 The riverfront is my beat, as I may have mentioned, and on a bike ride Wednesday I discovered that construction had begun on the long-awaited project to light up the night along Albany’s Dave Clark Riverfront Trail. Crawford Electric of Stayton has a $298,008.10 contract to install lighting along the paved path, which extends from Monteith Riverpark in the west to a short section of Front Street near Bowman Park in the east. The contract calls for 80 light poles between 70 and 100 feet apart, plus one wall-mounted fixture. The poles, 16 feet tall, will be crowned with LED fixtures. On Wednesday the crew was putting in underground power before installing the poles. City officials and others had been talking about lighting the path for years, and the advisory board of the Central Albany Revitalization Area (CARA) agreed to fund the project in March 2015. In December, the low bidder got the job. The contract calls for the installation to be finished by the end of June. The system will have a timer feature allowing the lights to be reduced to half power during a pre-set period of the night. The extent of that not-so-bright period has not yet been determined.